I decided to get a GoPro camera. If you have not heard of these it may be due to the fact the main purpose of this camera is for extreme sports. I myself don’t do crazy sports or stunts but still I though I could have some fun with the camera. Lets start with the basic stuff. You want to have good light. So far the performance has not been too great in low light. In daylight the color and quality are top notch. I like the widest view as it give a semi-fisheye effect to the video. I also like to use the 60 frames so I can slow down my video and not loose quality. The drawback is only shooting in 720 not 1080. If you don’t plan to use slow-motion effects then I say go all out and use the 1080p mode. I have the helmet kit so it came with a lot of different mounts and a headband mount. I also purchased the roll-bar mount and the wrist mounts. The camera case has 2 backs. One is open allowing better sound while the solid back is better suited for high-speeds and rated up to 160’ under water. Did I mention this is a sports camera? Other mounts for surf boards, skateboards, suction cup, and different adhesives are available as well. I have posted a couple quick videos I put together. 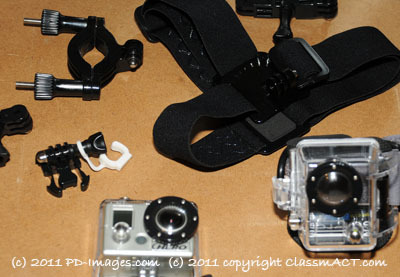 1 is using a helmet mount and attaching it to my dog’s collar and the other I used different mounts on my motorcycle.